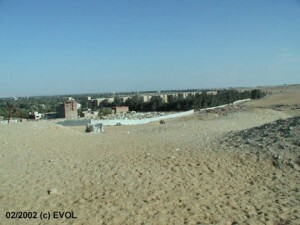 Since the beginning of 2002, Dr. J.J. Hurtak and a European team of investigators and explorers have been recording the construction of a massive system of walls being placed around the historic pyramidal sites and the larger unexcavated area of Giza, Egypt — in total, an area covering approximately eight square kilometers. 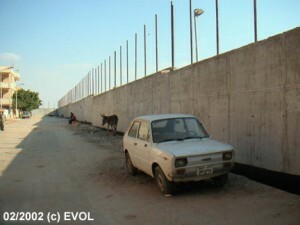 Why build these massive walls at this time? Certainly Giza is one of the finest archaeological zones of the world. Are there new treasures of ancient Egypt yet to be uncovered that require sophisticated technology and surveillance platforms, to protect the ongoing research along the Giza plateau? Has, perhaps, an area been discovered that shows tracings of rare earths and unique minerals? Or is it simply, as some officials are claiming, a move to protect the plateau from terrorists and control the masses of tourists visiting the area? The standard argument for the creation of such a wall is “crowd control”, but the details of this new construction suggest an initiative that is both multi-purpose and grand scale: the wall near Nazlat al Salman will be, at a minimum, 7 meters (22 feet) high. Are such measures solely for crowd control? The walls have been built in stages. 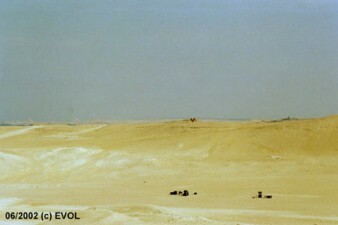 Images taken in February of 2002 reveal the walls extending far out into the desert where, for the most part, they have not been noticeable to the average visitor. 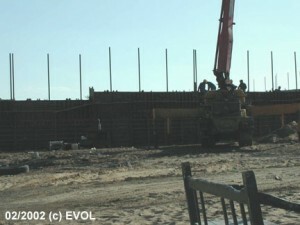 Note the foundation and the massive re-bar supports. 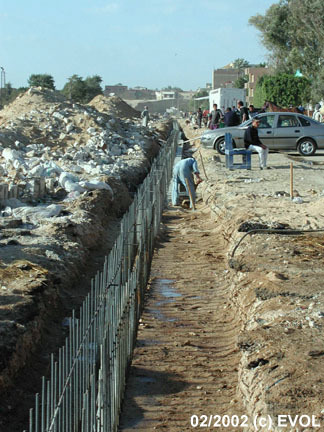 The walls have been carefully constructed on a deep and wide foundation (at least 2 meters below ground) with iron rod poles poised to support the concrete interfaces, with room for a special attachable cover. All in all this suggests a gargantuan wall. This barrier would enclose all major archaeological activity but would do nothing to protect the archaeological site from the strong winds that blow across the plateau. So vast is this structure that some local village homes have been removed, suggesting that what is envisioned on the plateau is more than just a restricting device for visitors to the popular site. What we see is a larger, carefully thought-out design, encompassing neighboring findings and, perhaps, protecting underground graves, tunnels and passages. The psychological reality of guards stationed as sentries at intervals along the entire wall carries the intrigue of a major feature film set, designed for the few experts who are to find an underground sphinx or obelisk, or a connection between Osiris and the constellation of Orion, rather than an open-door feature for thousands of well-behaved international students of history and archaeology who have never needed to be extensively controlled. Indeed, are the chambers of the deep being closed in the 21st century to students of world culture history who follow in the footsteps of explorers like Charles Piazzi Smyth and R.A. Schwaller de Lubicz, who entertained a higher meaning to Egyptian architecture? Are these sites now being closed to technologically gifted explorers at a time when new proto-historic findings could serve to unite the various camps of thinkers and philosophers in the Near East on the basis of a grand history for all people? We hope that newly discovered realities within the walls will not be limited to the few, and that there will be no concealment of important historical information that could bring a higher knowledge and unity to all humankind. — Dr. J.J. Hurtak, Ph.D., Ph.D.